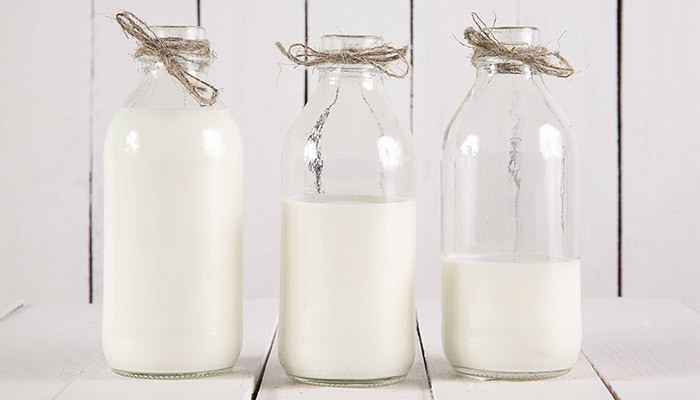 Can Milk Improve Brain Health and Prevent Alzheimer’s Disease? Glutathione is a major antioxidant in our brains and is known to fight against oxidative stress and protect our nerve cells. Therefore, increasing glutathione concentrations could be an important strategy to promote brain health. - In-Young Choi, Associate Professor of Neurology at the University of Kansas Medical Center. People associate milk with strong, healthy bones and teeth, but recent research published in The American Journal of Clinical Nutrition suggests significant cognitive health benefits. Drinking milk regularly may help keep your brain young and stave off Alzheimer’s disease late in life. Researchers at the University of Kansas Medical Center studied the diet of 60 adults over a one week period. The participants were then given a brain scan in order to measure the level of a naturally occurring antioxidant, glutathione. Participants who drank the most milk also showed the highest levels of glutathione. Milk helps boost reduced glutathione levels because it contains an amino acid known as cysteine, a building block for glutathione synthesis. Vital for the detoxification of the body, glutathione scavenges free radical species and helps prevent cellular damage. Generally glutathione levels are quite low later in life, as it naturally decays as we age. Other factors that can reduce glutathione levels are: air / water pollution, poor diet, certain pharmaceuticals, lack of exercise, exposure to radiation. Glutathione is a perfect example of how modern day living could be playing a role in increased disease states and illness, – Dr. Choi, Ph.D. The brain is extremely vulnerable to damage caused by oxidative stress. When glutathione levels drop too low, it impacts our cognitive health, according to Dr. Isaacson, Director of the Alzheimer’s Prevention Clinic at Weill Cornell Medical College. Is Milk The Only Answer? Eating foods that help boost glutathione levels is vital to maintain cognitive health and help prevent neurodegenerative disorders like Alzheimer’s disease. Unfortunately, milk may not be the answer for everyone. Many people are lactose intolerant or concerned with the amount of sugar, hormones or steroids found in milk. Another problem is that the pasteurization process can damage these glutathione precursors and severely limit its health benefits. Keep in mind, this study was funded by the Dairy Research Institute. One of the best ways to naturally boost glutathione production through your daily diet is to use a quality whey protein. It is important to choose an undenatured whey protein, one that hasn’t been processed using heat. A cold processing method will help preserve the whey proteins health benefits by leaving glutathione precursors intact. Other ways to get more glutathione through your diet is to consume plenty of sulfur-rich foods like cruciferous vegetables, onions and garlic. Still Aren’t Getting Enough Glutathione? Supplementing glutathione levels through capsules, gels and even intravenously has become quite popular. Commonly used by natural health practitioners to help improve liver function and detoxify the body. It has also popped up in the media as a popular hang-over relief method used by celebrities. Recent studies have shown that oral L-glutathione supplements can effectively boost glutathione levels in the body. You can also supplement with GSH precursors such as N-acetyl-L-cysteine to give your natural glutathione production a jump-start. Maintaining high levels of this antioxidant throughout the aging process is important for our neurological health, immune function and overall well-being. Fighting oxidative damage improves the health and function of virtually every cell and system in the body, keeping us youthful and energized.